Keeping you informed of the progress and status of our work. First a brief recap. Since the first newsletter, we have progressed greatly on this initiative. The Cradle to Career Planning Team (C2CPT) was formed and has met several times. Last week, the team continued in the planning process, holding our third session. Participation by this team has been excellent with extensive time commitments, participation, teamwork, and enthusiasm for the work. We are currently working to refine proposals on our recommended purpose, outcomes, goals, geographic scope and budgetary needs. Organizations involved in planning have committed additional resources to bring StriveTogether back on August 31 to help us complete our recommendations for a shared backbone structure to sustain this work across the community over time. Our work with the StriveTogether experts will include specific focus around our Data Jedi team, Investor Circle, Leadership table and operational backbone. The efforts of this team are all building towards a set of recommendations that will be presented at a community forum when the work is ready for broader discussion. After community agreement, we will launch the backbone structure and leadership council. We appreciate the patience of the community and all of our supporting partners as this first phase of planning work takes place. 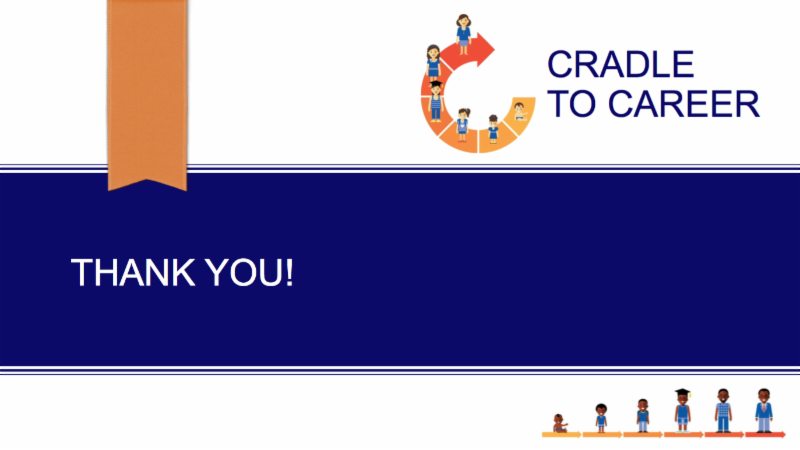 If you have comments, input and/or feedback, please contact us at cradle2career2017@gmail.com . Please feel free to forward this newsletter to others, including your boards, colleagues, friends and family. Attached is more detailed status of our work and timelines.